There are a number of committed and dedicated people around the country (North & South) who organise private coach transport from their community with pickup points nationwide. To help you with your travel arrangements please scroll through the list of organisers below. The One Day Retreat organiser bookings for May and August/Sept are listed first and below this the Three Day Pilgrimage organiser bookings for June, July & August. This list is continuously being updated as and when we receive new bookings. If you wish to join a Group Pilgrimage or Retreat please contact the organiser direct. If you are looking for a coach from a location not listed below please contact us as we may be awaiting updates from regular pilgrimage organisers, call 00353 (0) 71 9861518 and we will try to help you. We post details of groups and their organiser once they make a booking and give us permission to share their details on our website to support people who are seeking transport to Lough Derg. Organised coach travel from Warrenpoint for One Day Retreat on Lough Derg. 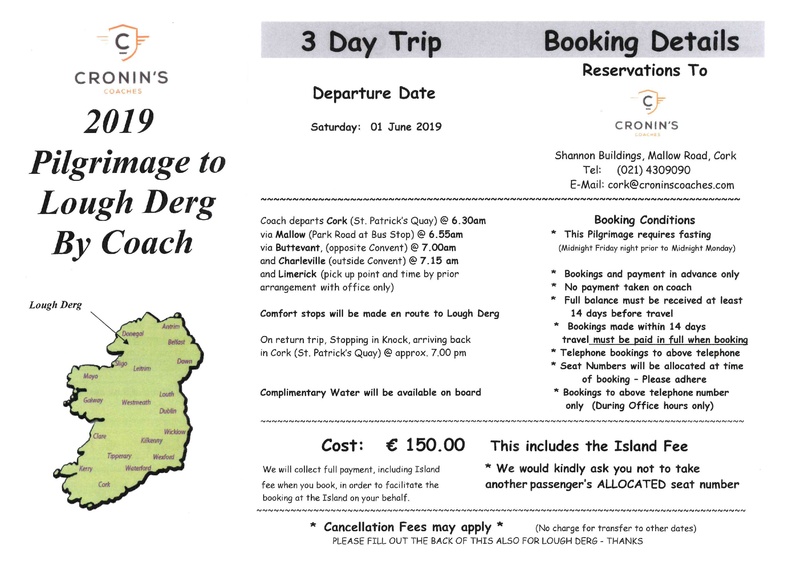 For further information and bookings contact Cormac O’Connor Coach Tours, Castlelawn, Kilbrittain, Co Cork on 023 8849196 or mobile: 087 6167835. One Day Retreat to Lough Derg. Departing from Lidl carpark, Thurles at 6.30am. Pick ups available from Durrow at 7.15am, St Peter & Paul’s Church, Portlaise at 8.00am. Can also pick up in Tullamore or Roscommon. Full amount payable 5 days in advance please. Refundable in exceptional circumstances only. Departing Cork on Saturday 8th June, staying overnight in Bundoran on Saturday night. 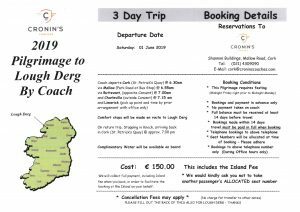 Travelling onwards to Lough Derg on Sunday 9th June and returning to Cork on Tuesday 11th June. Bus leaving Waterford Friday 5th July 2019 at 12 noon. Staying in Donegal on Friday night, onward to Lough Derg early on Saturday morning. Leaving Lough Derg Monday morning 8th July, arriving back in Waterform around 6/7pm. Check poster below for the pick up times. For information & bookings contact Fr Gerry Davey on 087 2754185.